Sometimes as crafters we do things that seem like a good idea at the time, only to doubt ourselves a day or two later. This post is about that experience, documented with lots of photos. 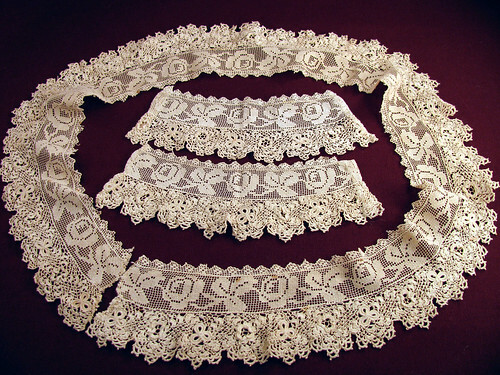 I found this Irish crochet lace. I thought it looked really bad, spotted and discolored. The photo I took before I started to clean it makes it look OK, though the spots are visible. Then I soaked it in Oxyclean and it came out a really dirty grey color, like a used string mop. Again the photo doesn’t really show the color I thought I saw. 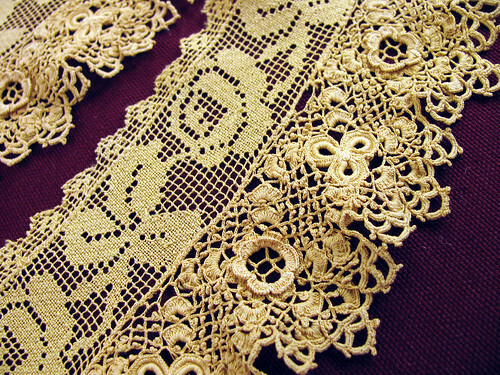 Some places had been mended and the thread in those areas turned a gold color. Well, I thought why not dye it gold, and old gold color, that would go with gold trim so I could use it on Christmas decorations. The color came out pretty close to what I wanted. The olive gold color, DMC 834 is close, is not a pretty color by itself. It looks really good with deep reds and greens of an old fashion Christmas though. 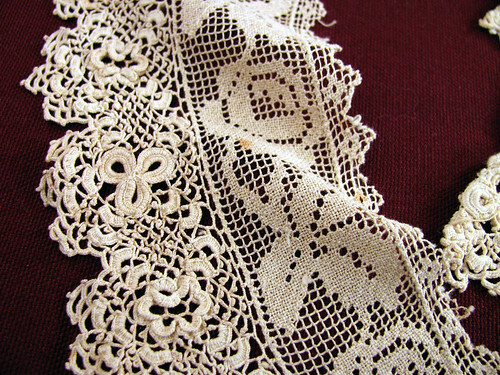 This is really old lace and was probably made by improvised women by candle light and I have turned it an odd color. What seemed like a good idea two days ago doesn’t seem that way today. 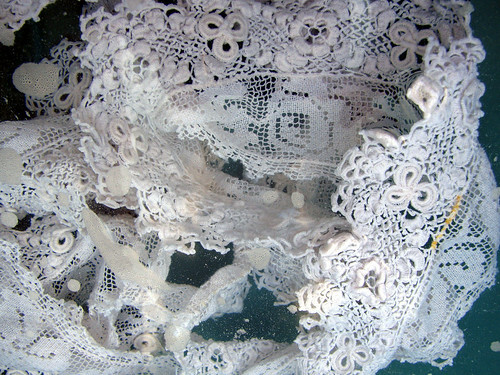 This entry was posted on Tuesday, March 31st, 2009 at 3:00 am and is filed under Craft, Crochet, Lace and Vintage. 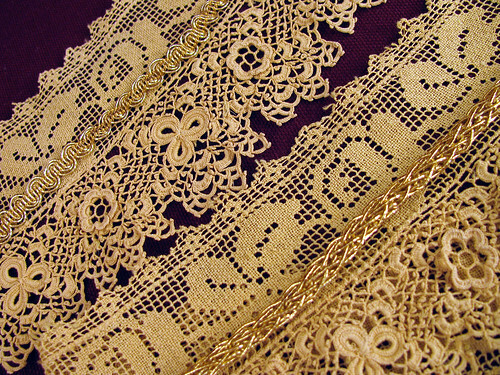 Tagged: Craft, Crochet, Lace, Vintage. You can feed this entry. You can leave a response, or trackback from your own site. stumbled upon your blog. I bought a lovely old hand made crochet tablecloth a couple years ago. 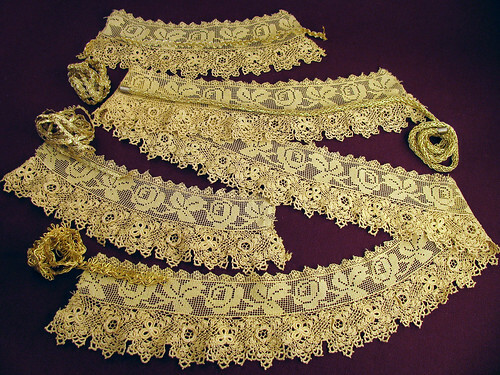 It has some issues, what a great idea to dye it…I hadn’t thought of gold, perfect!